I promised a few examples of spreadsheet driven apps. You may remember the Hipster List was the first example. These are simple web apps that are initialized using data from a Google Spreadsheet once the user loads them in a browser. 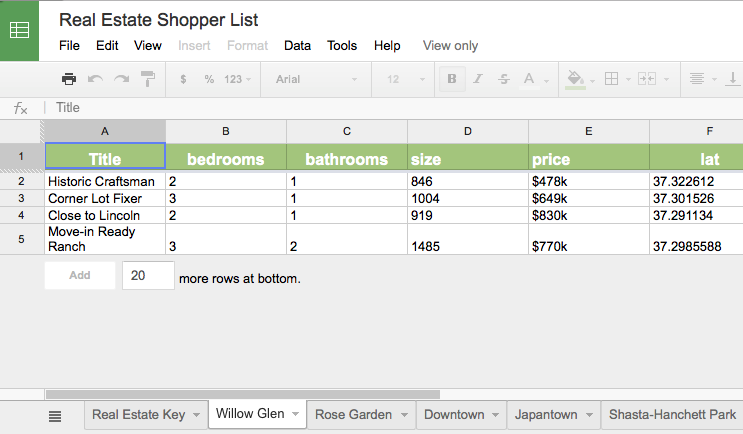 Using spreadsheets to keep app information current is easy for anyone. There is even a way for users to point the app at their own Google Spreadsheet if the app developer wants to turn feature that on. The next example of a spreadsheet driven app (below) is the Mobile Buyer's Agent app. This may take a little time to load because it is an experiment, and thus not using a vulcanized Polymer library, so it is importing lots of individual library documents. Be patient and once cached in your browser it will be fast. The idea is to create a mobile web app that can be used by buyers as they shop for a home. 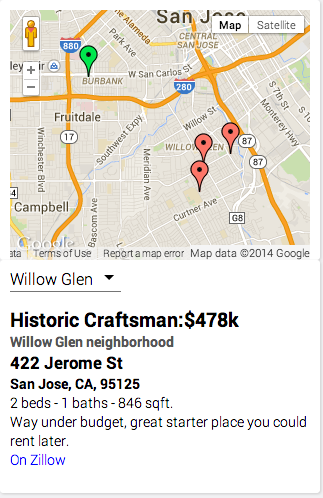 Once again the data is maintained in a Google spreadsheet, this time by the buyer's agent. The agent can add houses, home information, and notes to the spreadsheet and the buyer can use the app to view the information as they shop. This is an easy way for an agent to personalize their client experience. Take a look at the spreadsheet to see how information is organized. It allows the agent to add personalized title and notes to each house. The README document provides more details on how the app was built. Or try the app here. I will likely provide a few updates to this app in the near future to make it a bit more interesting, but I though the first version showed a few nice features, and how to build them.